We have three endocrinologists as part of the group, They specialize in the management of the gamut of endocrine disorders which include diabetes and thyroid problems. Dr. McLaughlin is the chief of endocrinology at Mount Auburn Hospital. She performs in-office ultrasounds and needle biopsies of the thyroid gland. ​Dr. Sahin-Efe is a general endocrinologist and diabetologist. 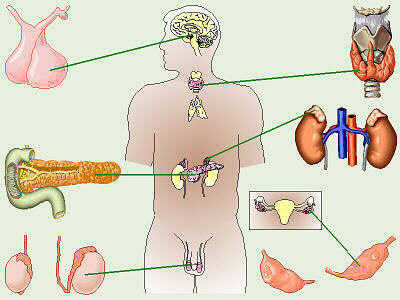 The endocrine system is a complex group of glands. Glands are organs that make hormones. These are substances that help to control activities in your body. Different types of hormones control reproduction, metabolism (food burning and waste elimination), and growth and development. Hormones also control the way you respond to your surroundings, and they help to provide the proper amount of energy and nutrition your body needs to function. The glands that make up the endocrine system include the thyroid, parathyroid, pancreas, ovaries, testes, adrenal, pituitary and hypothalamus. What type of medical training do endocrinologists receive? Endocrinologists finish four years of medical school and then spend three or four years in an internship and residency program. These specialty programs cover internal medicine, pediatrics, or obstetrics and gynecology. They spend two or three more years learning how to diagnose and treat hormone conditions. Overall, an endocrinologist's training will take more than 10 years. What are the most common endocrine diseases and disorders? Diseases and disorders of the endocrine system can be grouped into several different areas. Some endocrinologists focus on one or two endocrine system diseases, such as diabetes, pediatric disorders, thyroid, or reproductive and menstrual disorders. Others work in all areas of endocrinology. The major areas of endocrinology are described below. Patients with diabetes have too much sugar in their blood. Recent studies have found that controlling blood sugar helps prevent serious problems that can be caused by diabetes. These can include problems with the eyes, kidneys and nerves, which can lead to blindness, dialysis, or amputation. Endocrinologists treat diabetes with diet and medications, including insulin. They also work closely with patients to control blood sugar and monitor them so they can prevent health problems. Patients with thyroid conditions often have problems with their energy levels. They may also have problems with muscle strength, emotions, weight control, and tolerating heat or cold. Endocrinologists treat patients with too much or too little thyroid hormone (conditions respectively caused by either an overactive or underactive thyroid). They help patients reach a hormone balance by replacing or blocking thyroid hormone. Endocrinologists also receive special training to manage patients with thyroid nodules or thyroid cancer, and enlarged thyroid glands. Osteomalacia (rickets), which causes bones to soften, and osteoporosis are bone diseases that endocrinologists diagnose and treat. Osteoporosis is a disease that weakens your skeleton. Certain hormones act to protect bone tissue. When hormone levels are abnormal, bones can lose calcium and weaken. Menopause, in women, and loss of testicle function, in men, and aging may put you at risk for bone fractures. Endocrinologists treat other disorders that can affect bones, such as too much parathyroid hormone and long term use of steroids like prednisone. About one in ten American couples are infertile. Endocrine research has helped thousands of couples to have children. Endocrinologists diagnose and treat hormone imbalances that can cause infertility, and also assess and treat patients with reproductive problems. They work with patients who need hormone replacement. Problems treated by endocrinologists specializing in reproductive endocrinology include menopause symptoms, irregular periods, endometriosis, polycystic ovary syndrome (PCOS), premenstrual syndrome, and impotence. Endocrinologists treat patients who are overweight or obese, sometimes because of metabolic and hormonal problems. When someone is obese they have too much body fat. Thyroid, adrenal, ovarian, and pituitary disorders can cause obesity. Endocrinologists also identify factors linked with obesity, such as insulin resistance and genetic problems. The pituitary is often called the master gland of the body because it controls other glands. The pituitary makes several important hormones. Over - or under - production of pituitary hormones can cause a hormone imbalance that can lead to infertility, menstrual disorders, growth disorders (acromegaly or short stature) and too much cortisol production (Cushing's syndrome). Endocrinologists control these conditions with medications and refer patients who need surgery. Children and adults can have effects from not making enough growth hormone. Pediatric endocrinologists treat children who suffer from endocrine problems that cause short stature and other growth disorders. Adults with growth hormone deficiency can experience emotional distress and fatigue. Safe and effective growth hormone replacement therapy is available for people with growth hormone imbalance. Hypertension is high blood pressure, and it is a risk factor for heart disease. Up to 10% of people have hypertension because of too much aldosterone, a hormone produced in the adrenal glands. About half of these cases are caused by growths that can be removed with surgery. Conditions such as the metabolic syndrome or a rare adrenal growth called a pheochromocytoma also may cause a hormone imbalance that leads to hypertension. These conditions also can be treated successfully. Patients with lipid disorders have trouble maintaining normal levels of body fats. One of the most common lipid disorders is hyperlipidemia - high levels of total cholesterol, low-density lipoprotein cholesterol (known as "bad" cholesterol), and/or triglycerides in the blood. High levels of these fats are linked to heart (coronary) disease, strokes, and peripheral vascular disease (problems with circulation in the legs). Endocrinologists are trained to detect factors that may be related to lipid disorders, such as hypothyroidism (a hormone imbalance caused by thyroid conditions), drug use (such as steroids), or genetic or metabolic conditions. Lipid disorders can be found in several conditions that require special management, including the metabolic syndrome, polycystic ovary syndrome (PCOS), and obesity.